In this article, we will learn all about EnumMap in Java. What is EnumMap and how to use it with examples? 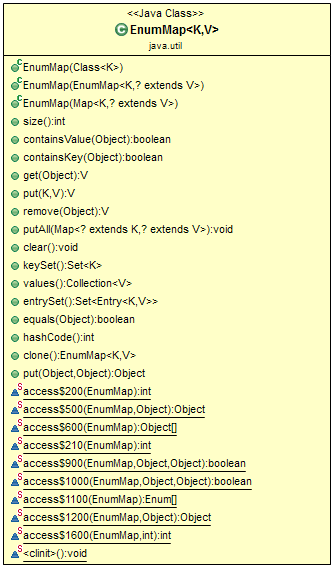 All keys used in EnumMap must be from same Enum type which is specified while creating EnumMap in Java. For example, if you can not use different enum instances from two different enums. EnumMap is an ordered collection and they are maintained in the natural order of their keys( natural order of keys means the order on which enum constant are declared inside enum type ). you can verify this while Iterating over an EnumMap in Java. Iterators of EnumMap are fail-fast Iterator, much like of ConcurrentHashMap and doesn't throw ConcurrentModificationException and may not show an effect of any modification on EnumMap during Iteration process. You can not insert null keys inside EnumMap in Java. EnumMap doesn't allow null key and throws NullPointerException, at same time null values are permitted. EnumMap is not synchronized and it has to be synchronized manually before using it in a concurrent or multi-threaded environment. like synchronized Map, in Java, you can also make EnumMap synchronized by using Collections.synchronizedMap() method and as per Javadoc this should be done while creating EnumMap in java to avoid accidental non synchronized access. EnumMap likely gives a better performance than HashMap in Java. So prefer EnumMap if you are going to use enum keys. EnumMap(Class keyType) - Creates an empty enum map with the specified key type. EnumMap(EnumMap<K,? extends V> m) - Creates an enum map with the same key type as the specified enum map, initially containing the same mappings (if any). EnumMap(Map<K,? extends V> m) - Creates an enum map initialized from the specified map. void clear() - Removes all mappings from this map. EnumMap<K,V> clone() - Returns a shallow copy of this enum map. return "[project id : " + this.id + ", project name : "